Vientiane International Airport, also referred to as Wattay International Airport, serves Laos’ capital city, Vientiane and is one of the few international airports within the country. Our Vientiane International Airport guide provides information on the airport terminals in addition to airport contact details and hotel recommendations. An information desk can be found at the International Terminal at Vientiane International Airport. There is also an information booth in the Departures lounge that can help you to locate the airport facilities you need. From Vientiane city centre, head northwest on Rue 23 Singha towards Nongbone Road. Follow into Saylom Road and then take Khun Bu Lon Road for 1.6km (1 mile). Finally, drive along Rte Luang Prabang/Souphanouvong Avenue/Route 13 until you reach Vientiane International Airport. The drive time is approximately 20 minutes. Vientiane International Airport is located 3km (1.8 miles) from Vientiane city, Laos. Coach: A shuttle bus stop can be found outside the International Terminal. The shuttle bus travels between Vientiane International Airport and the Central Bus Station in Vientiane city centre, stopping off at several hotels along the way. A single journey from the airport to the city centre costs 15,000 kip. 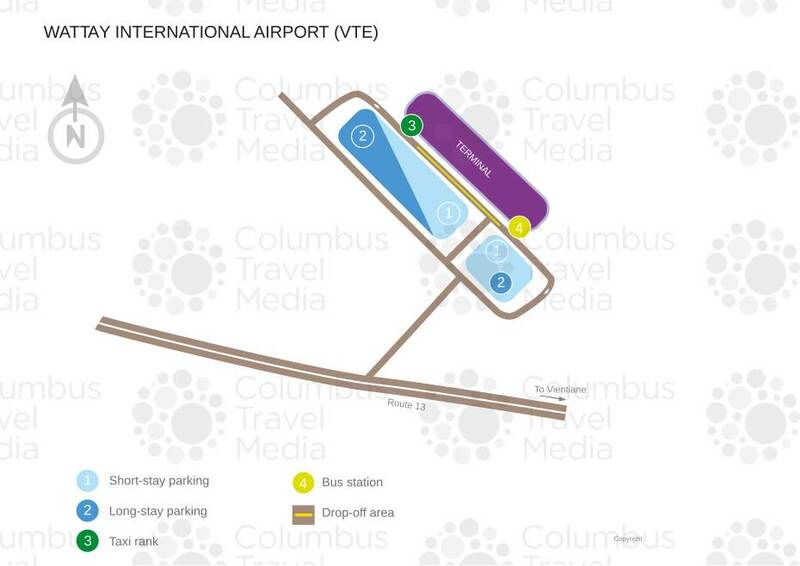 Taxi: Taxi stands can be found at both the Domestic and International Terminals near the Arrivals exit. Taxi coupons must be bought from the airport taxi counters inside the airport before you hail a taxi at the stand. A taxi from Vientiane International Airport to Vientiane city centre costs approximately 57,000 kip. Currency exchange counters and ATMs can be found at Vientiane International Airport. The International Terminal at Vientiane International Airport has a café on the third floor serving a range of light meals and snacks, plus hot and cold drinks. There is also a buffet style restaurant on the third floor offering a selection of international and local dishes. Duty free shopping is available at Vientiane International Airport. In addition to this, there are also several small souvenir shops located throughout the terminals. Luggage storage facilities are not available at Vientiane International Airport. Vientiane International Airport offers a Business Lounge where, for USD$10, you can have access to Wi-Fi, telephones, TVs and a range of snacks and drinks. Other than the Business Lounge, Vientiane International Airport does not provide any conference facilities. However, there are extensive conference and business facilities located at Don Chan Palace Hotel (tel: +856 21 226 666; www.donchanpalacelaopdr.com/), only a 20-minute drive away from the airport. Wi-Fi is not freely available at Vientiane International Airport, except in the Business Lounge. There is an internet café available in the Departures area. A post office can also be found in the Departures area. For specialised service, please contact the airport (tel: +856 20 55 608 955) or your airline directly. The car park at Vientiane International Airport is located in front of the terminals and offers covered and uncovered parking spaces. The following car hire services are available at Vientiane International Airport: Sixt, Avis and Budget Car.